I had hopes of getting to at list one of the other "i" topics I threw out on Google+ yesterday (intelligent swords, insanity charts, and injury tables), but the evening got away from me. I did get about halfway done with the intelligent swords page, so you'll probably see it at some point. 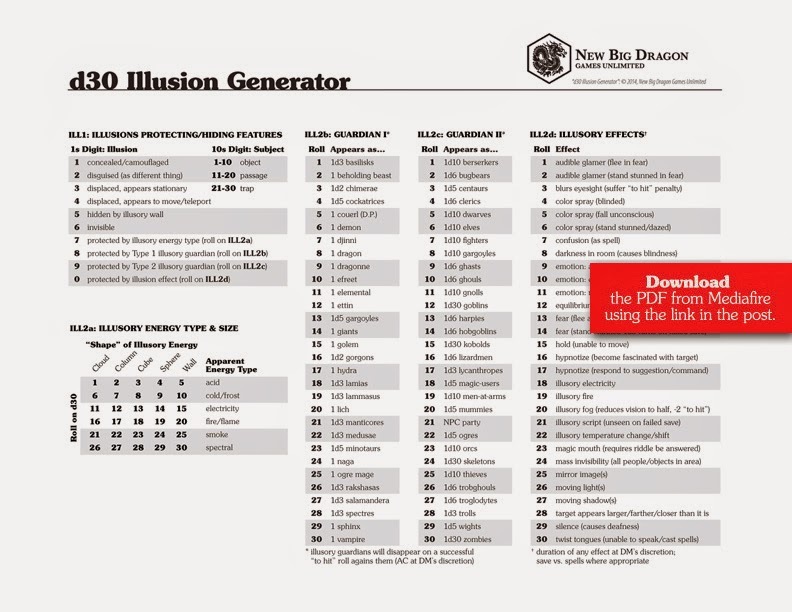 I'm not 100% sold on everything about this illusion generator, but think it does a good job of being a thought starter (which is really what I want most of these d30 charts to really do). Will it change over time? Possibly. A lot of charts from the d30 Sandbox Companion went through a lot of refinement before I thought they were book ready. This may be one of those kinds of pages (not that I have any kind of next book planned... which I may or may not). d30 Illusion Generator from MediaFire. Nah, this one is good. Do you know how many intelligent sword generator tables there already are? This one is something new. Well, however many intelligent sword generator tables there are already, add one more. Mine is done and will be posted around noon CST today. It is a handy one, I'll agree, and thank you, as this one is nice and clean. A totally unrelated question: Sandbox Companion, Road Encounters, pp. 24-25. When I get attackers, I can get the relative total and level, but who is attacking? I keep thinking I'm missing something. That was left a little ambiguous on purpose (but possibly could have been explained, has room permitte)—the attack group is more marauder than bandit, and can be whatever type fits the area. E.g., the attacking group can be bandits (thieves) who would rather kill first then steal, or fighters (e.g., pathological military deserters), or even a mixed-class group of NPCs (comparable to party). It could even humanoids (using HD in place of level for determining strength). Agreeing with Charles. I was more interested in insanity, but there are a number of thise too. Illusions seems new - and who knows, some of them might be real.... Thanks again for putting all this out into the world!